A UChicago entrepreneurial hub opening in late 2014 will hatch ideas into fledgling businesses, University officials announced last Friday. 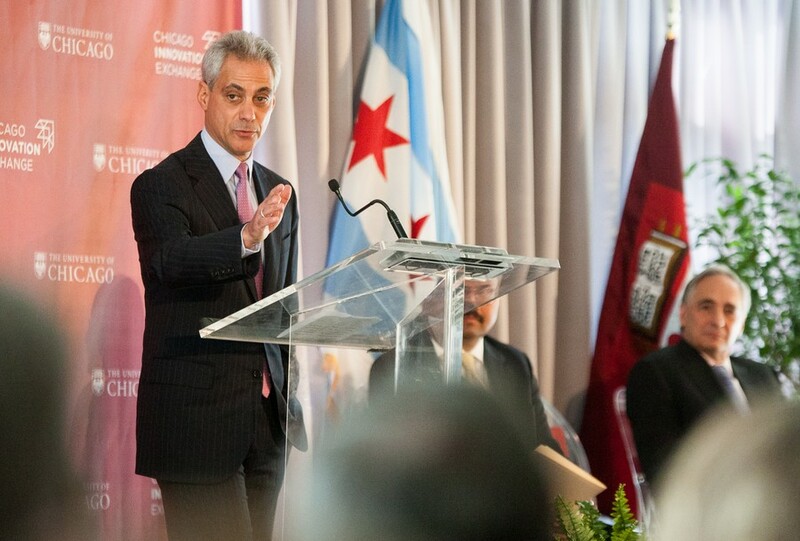 The new Chicago Innovation Exchange (CIE), located on East 53rd Street and South Harper Avenue, will provide workspace, collaborative opportunities, and financial support for entrepreneurs across the University and the city. “[The CIE] will create a hub for University faculty, students, alumni, and researchers as well as external businesses who want to be located near all this talent and energy. The exchange will give them access to programming and expertise, venture capital and, perhaps most importantly, access to each other,” University President Robert Zimmer said at the announcement. Drawing from a privately sourced, philanthropic investment of $20 million, the CIE will incubate five to 10 businesses annually, making an average investment of $50,000 to $100,000 per business, according to CIE Executive Director John Flavin. The Center differs from existing venture creation initiatives such as the Booth School of Business’s Polsky Center—which is one of CIE’s partners—in that the Exchange provides opportunities at an earlier stage. This “wider net” means investing in ideas across multiple different industries. Flavin, a former science and technology venture capitalist, pointed out that the word “exchange” is befitting to the CIE, as the Center aims to serve as the nucleus of a network of interconnected University institutes and affiliates, ranging from medicine to education. The Center’s combined 21,000 square-feet spread between two buildings will also house the offices of the Institute of Molecular Engineering’s water research initiative and the offices of Argonne National Laboratory’s energy storage hub, bringing Argonne to Chicago for the first time. Through its multidisciplinary approach, the Center will continue the University’s tradition of groundbreaking scientific research and combine it with its more recent success in launching businesses, Zimmer said. Since its inception in 2003, the Polsky Center and its “venture challenges” have led to the creation of more than 90 startups, including GrubHub, Braintree, and Kip Solutions. “What we’re trying to create here is a Chicago innovation ecosystem, of which the Chicago Innovation Exchange and the University of Chicago is just a part,” he said. This year, the CIE will pilot a Student Associates Program for graduate and College students. Associates working in teams of 15 will be responsible for evaluation and assessment of business ideas as well as the operations and logistics of the Center’s programing, according to Flavin. The CIE will be located primarily on the second floor in the historic building currently home to Harper Theater and future home to chef Matthias Merges’ upscale European restaurant A10. Renovations are expected to complete by next fall, according to University Commercial Development Manager John Dennis. At the announcement on Friday, Mayor Rahm Emanuel congratulated the University and compared the center to digital start-up incubator 1871. State Senator Kwame Raoul, state representatives Barbara Flynn Currie (A.B. '68, A.M. '73) and Christian Mitchell (A.B. '08), and Fifth ward Alderman Leslie Hairston were also in attendance.